The other day I struck up a conversation with a mom at the opera house. I realize that seems strange, but both our kids are in a youth opera program. I had not met this mom before, but she knew who my son was because her daughter thinks my son is cool. Which is cool because my son is not cool. He’s a total geek. He’s into the opera for goodness sake and has been since he was 4! But that’s why I have him in this program. To get him around other kids who are like him and into opera too. Turns out there are a LOT of kids that like opera! Having a tribe of kids like you is important. It makes getting through the hassles of dealing with mean kids who make fun of you for geeking out easier to bear. Anyway, as I spoke with this mom, she confided in me that her daughter had been bullied and is currently being home schooled. Bullying is not quite the correct language to describe what her daughter experienced. Her daughter was being physically battered by kids we would normally describe as bullying. To translate that for you – she was being physically hurt, corners, and choked by another kid. When that kid was expelled, his friends passed around text saying they would finish what their friend had started. What she described as bullying, isn’t bullying. It’s assault and battery and it’s criminal. This mother’s daughter is an awesome kid who has gone through some really horrible things. So of course, I gave her my card and told her about all the free material on my website and that I would give her my book etc. It breaks my heart to hear these sorts of stories. How bad is bullying? 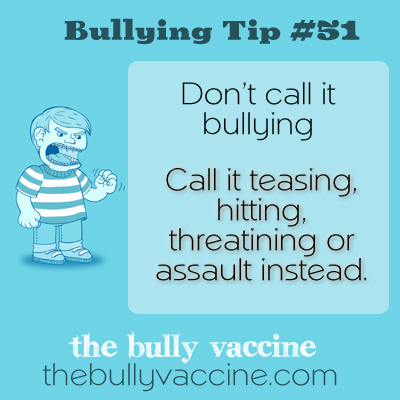 It can be really bad – which is why we need to stop calling inappropriate behavior by children bullying. It’s not. It’s inappropriate. It is not a right of passage and kids and parents need to learn how to take control of these situations to make them stop!!!!! If you have a child who is experiencing this or know someone who is – please share this website with them. I have a LOT of free material on this site. In fact, you can access everything here for free! I do not maintain this site to make money from people experiencing tragedy. I maintain it to help people help kids. So help me help people by sharing this material with them. Please.